A large portion of the potential for energy efficiency in existing buildings and potential to utilize solar energy still remains unused. Globally, goals and specific targets are set up to reduce our environmental impact on climate and secure future supply of energy. The built environment accounts for over 40% of the world’s total primary energy use and 24% of greenhouse gas emissions. A combination of making buildings (refurbishing and new developments) more energy-efficient and using a larger fraction of renewable energy is therefore a key issue to reduce the non-renewable energy use and greenhouse gas emissions. Political statements and directives are already moving towards zero-energy buildings, communities and whole cities. 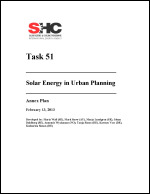 An increased use of solar energy is one important part of the development ahead, where the urban fabric needs to utilize passive solar gains and daylight to reduce the energy use in buildings and for lighting outdoor environments, as well as to improve the inhabitants’ comfort indoors and in urban outdoor areas. Also, active solar energy systems integrated in the urban context will enable a supply of renewable energy primarily as heat and electricity, but also of solar cooling, helping cities reach sustainable solutions.